This is the shower curtain that I have in Luke's bathroom. I bought the fabric at Hancock's and had it custom made and it was an ORDEAL!!!! But I wanted one that went from ceiling to floor and I love it! This is a metal piece that I bought at TJ Maxx when we were in Memphis. Eric picked this clock out a couple of years ago when we redid the house. I wasn't so sure about it at first, but now it is perfect! Pic of Luke...this came from Pier One. I should buy stock in their company...SERIOUSLY! This also came from Pier One and it's hanging in my bedroom! Do you have any circles in your house!?! Last week, Sylvan Hills High School celebrated it's 20 year High School Reunion. I cannot believe it has been TWENTY YEARS since I graduated! That just seems crazy. The morning of the reunion, I was able to meet two of my former BFF's from junior high...Mary Anne and Haley! I don't think the three of us have been in the same room together since 1986. We ended up graduating from three different high schools and just drifted apart. Facebook has been wonderful at connecting people (and horrible for my blogging...seem to spend all my time over there!). We met at Mimi's Cafe and had the best breakfast. We were cracking up at Haley because she had on such tall sandals! She was towering over me and Mary Anne. Haley is the mom of four, home schools and lives around here. Mary Anne lives in sunny Florida and is in Advertising like Eric. We had the best time remembering our friendship, talking about memories we had of each other, thanking the Good Lord that we didn't end up with former boyfriends and laughing the whole time. So glad to have reconnected with these sweet friends! Proverbs 17:17 says, "A friend loves at all times...". Here are Leslie and Patrick's sweet little babies. These are our new nieces...Geneva Marie and Lexa Joy. Geneva has the dark hair and Lexa's is blonde (Oh my goodness...I didn't even take one picture of Leslie or Patrick. I was too busy taking pics of the babies-sorry!). We took took turns holding them even when they were sleeping. Geneva's dress said "Miss Independent". They both had on little Fourth of July dresses. So cute. Lexa seemed to smile more in her sleep. Wonder what they dream about? Luke was really sweet with the girls. He's used to being the youngest on my side of the family, so I think he was just amazed at how tiny they were. Proud Uncle Eric-he loves babies so much. Aren't babies so fun to watch?!? Lexa and Geneva's due date was actually July 14th, so they technically aren't even supposed to be here yet. But I sure am glad they are!!! Lexa looks like a little baby doll! We had so much fun visiting with Leslie, Patrick, Geneva, Lexa, Whiskey and Corky! We are sad they live so far away...just have to make more road trips. Just a quick note to tell about our church's Vacation Bible School this year. We had the Crocodile Dock theme and it was soooooo good. I was a crew leader, which means I had the same group of kids each night (usually 10-12 of them) and myself and a helper would go from activity to activity with them. They had Bible lesson, snacks & games, crafts and music. The music was amazing this year! All of the props, teachers, leaders, games and activities were so appropriate and everything pointed the kiddos to Jesus. Luke and I picked up two of his friends this week each night. It was a little tiring going straight from work, picking up Luke, eating dinner, changing clothes, picking up his friends and going to church each night but as the week comes to a close it was SO WORTH IT. One of the little girls in our group got saved Thursday night after the lesson! She was from a divorced home and her grandma had been bringing her each night. She was so sweet and it was neat to experience. Luke is still at the age where the group activities at VBS are very fun! He really gets into the music, crafts, games-just all of it! 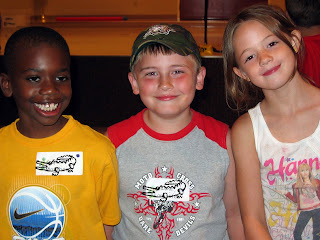 He loved having his friends Sadie and Jalen with him each night. He really listens well most of the time and only occasionally gets so hyper that I have to rein him in! Last night, when we gathered into the sanctuary the whole group (approximately 160 kids and 100 adult volunteers) sang songs. The first two songs were pretty high energy. But the last song called "Faith" was slow and sweet with great lyrics about how we have faith that Jesus is going to do great things! Earlier in the night the kids had gotten these little battery operated flame candles that went along with their Bible lesson. As the song "Faith" was being played along with a slide show of pictures from the week, I looked around the dark sanctuary. I don't know how it got started but almost all of the kids had taken their little flame candles and they were swaying their arms back and forth with the music. Just like at a concert! It was funny and sweet at the very same time. I'm usually not emotional at the times I'm supposed to be (i.e. weddings, first day of school, etc. ), but I think I got a little tear as I looked around at all those kids singing about Jesus and shining their lights. It was definitely a moment that I wanted to freeze. I thank God for my church and for giving me a little boy to love and take care of. It is my prayer that someday he grows to know the Lord in a personal way. I believe the Lord has great and mighty things for Luke! Ever since Luke has been in kindergarten, I have had him pose on the first and last day of school. It is so neat to see how he grows so much throughout the year. Here's Luke hanging with some of his best buddies: Sadie, Isaac and Jeremiah! Luke had an amazing 2nd grade year. The theme for his school this year was God's Top 10:The Ten Commandments. They had songs for each commandment and I pray that they stick to his memory. Luke is such a rule follower and I pray that knowing what God's rules are will help him as he gets older. Second grade was very busy for Luke. He learned how to carry and borrow 4-digit numbers and even multiply and divide! He finished a history project in the fall and a science project in the spring. He is writing more creatively as well. Last week he had to complete this writing assignment. Tell why you want this to be your job: 1. Because I get to eat ice cream all day 2. I only have to work in the spring and summer! What can you do now to prepare for this career: Practice scooping ice cream and drive slow! Eric and I are so proud of Luke and thankful that he LOVES school. This is just a crazy post with some really random pictures of me! I've had such a WONDERFUL birthday today! I'm 38 today! It's weird, because I don't really feel like I'm in my late 30s. Whew! I can vividly remember my mom turning 30 and now I'm way past that! :) And something that is weird about being 38 is that Eric and I started dating when we were 19. So I've now spent half my life with Eric! WOW! I'm so thankful for a sweet and loving husband. Eric and Luke got me sweet (and funny) cards, bought me Bath & Body Works stuff and a Fossil watch. We went to Sushi Cafe for my birthday dinner! YUM!!!! This crazy pic was taken at The Magic House in St. Louis a few years back! My hair was so long! And I'm wearing my Supermom shirt! Nice that my own friends made fun of me for wearing that! I don't care...I'm wearing it again this summer! FYI! You will see it again! Not everyone is a Supermom! But I am! Ha! The girls at work were SO awesome today! They decorated my office with balloons and streamers! Then we had a very yummy lunch! All low-cal stuff because they know I'm so trying to lose some weight before summer! We had salad, fruit, low-fat chicken salad & crackers, Weight Watcher 2-point Brownies and Strawberry Shortcake. Man! I really appreciate all their thoughtfulness! God has really blessed my life with many friends! Speaking of friends, I had TONS of friends (old & new) wish me a very happy birthday on Facebook today! So nice! I'm really striving to walk more closely to the Lord this year! I need to be in His Word more so I can hear what He's trying to tell me! I want Luke to say that he had a godly mother and that does not happen without discipline! I've had so many pleasant surprises today! I like to drag my birthday out and it even started last Saturday! I went out to dinner with my sister and friend, Kristie in the snow! Today, I had surprises from mom, Grandma, Kelly, Randie & Michael, Eric & Luke. I have no shortage of love ones and for that I'm so grateful! Has anyone ever told you to look up your Birthday Proverb? You use your birthday month and that is the chapter you look up. The day of your birthday is the verse. So mine is Proverbs 3:2 and listen to this!!!! Proverbs 3:2 says, "For they (God's teachings and commands) will prolong your life many years and bring you prosperity". Isn't that amazing? Sometimes it doesn't work depending on your birthday and sometimes they are downright funny! What is your Birthday Proverb? He looks like Eric in this one! These pics were taken right before his 3rd birthday. They were trying to shoot a Fourth of July ad for the bank and this is the picture they ended up using. It ran in the Conway newspaper. This is where he got his start...ha!